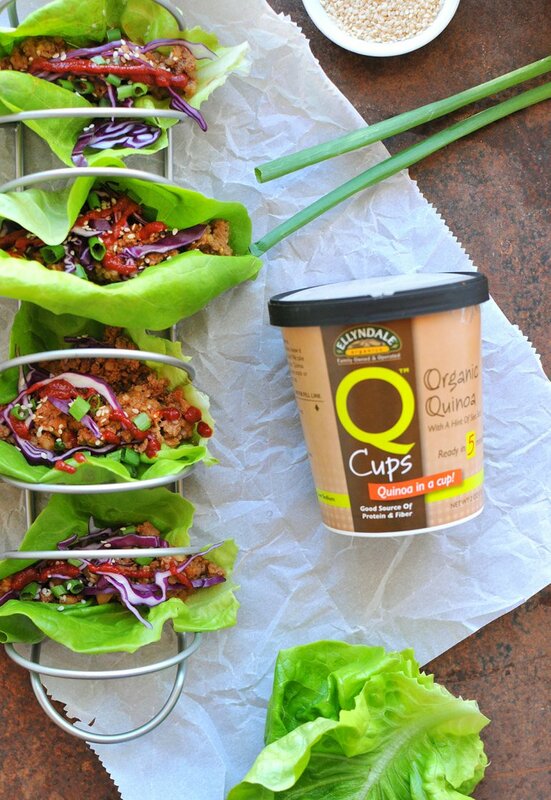 These Asian Lettuce Wraps are reminiscent of your favorite restaurant appetizer, but packed with superfoods like quinoa, sweet potatoes, citrus fruit, and olive oil --- and they're super easy to make at home, especially with Ellyndale®'s new Q-Cups! 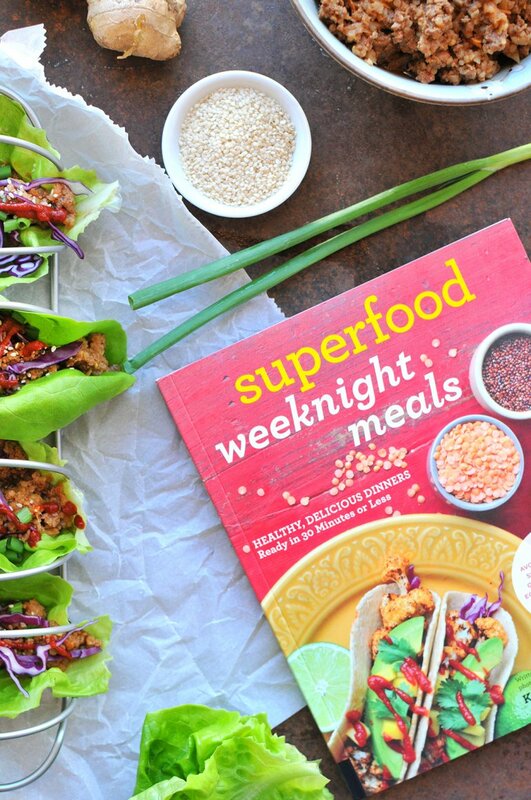 These lettuce wraps are one of the 100 recipes in my new cookbook, Superfood Weeknight Meals. Have you gotten a copy yet?! Dinner can be delicious, healthy, AND fast. When I started writing the book, I flirted with the idea of having an entire chapter dedicated to Sunday prep tasks that would set you up for success throughout the week—things like cooking quinoa, roasting vegetables, baking sweet potatoes, and so on. But, as I spoke with other busy people, I found they didn’t want to do a lot of work on the weekends, either. So, the only prep work I included in the book is cooking a batch of quinoa and lentils one day a week so when a recipe calls for 1 cup Quinoa-Lentil Blend (page 18) you’ll be ready. But, now it's even easier. Ellyndale® Q-Cups are my new favorite thing! 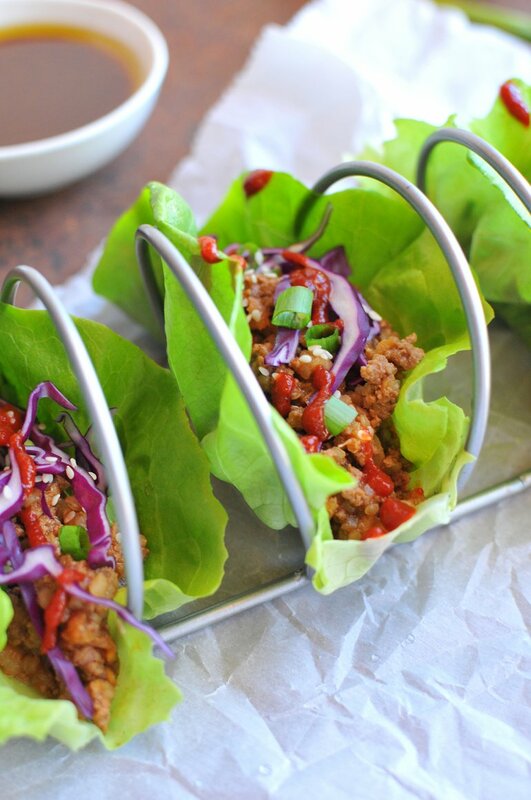 They're basically little microwavable cups of quinoa that are ready in just 5 minutes. 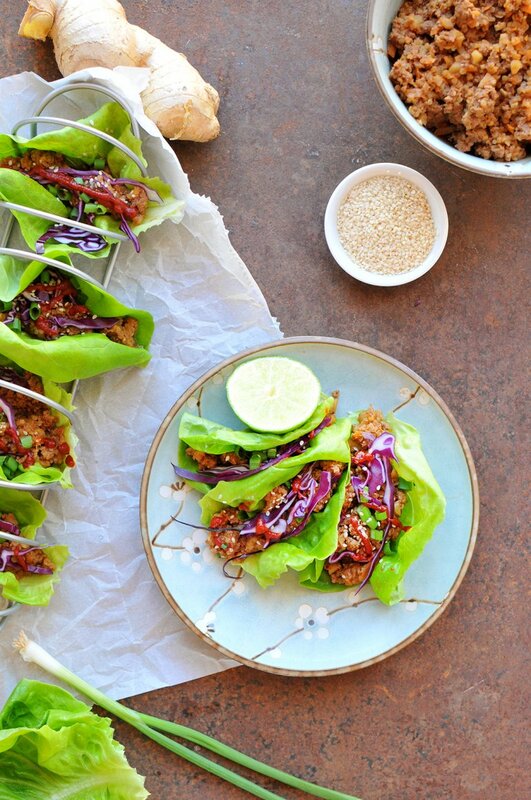 So, nowwwwwww, you don't even have to remember to cook quinoa on Sundays ahead of time. Whenever you want to make a recipe in the book, just pop one of these lil' guys in the microwave. Easy, peasy! And as for the ingredients? Quinoa COMMA sea salt. <--- I love the simplicity! And that they're organic! How to enter: Leave a comment below telling me your favorite way to use quinoa. TO MAKE THE MEAT: In a large skillet over medium-high heat, combine the ground beef, sweet potato, water chestnuts, quinoa, garlic, and ginger. Cook for about 5 minutes until the meat is browned and no pink remains. TO MAKE THE SAUCE: In a large glass measuring cup, mix the barbecue sauce, olive oil, soy sauce, rice wine vinegar, orange juice, Thai chili paste, honey, and sesame oil. Set aside. Once the meat is cooked, pour the sauce over and stir so everything is evenly coated. Cook for 3 minutes more until the sauce is warmed through. Scoop a generous mixture of the meat into each lettuce leaf. Sprinkle with scallions and sesame seeds and red cabbage (if using).